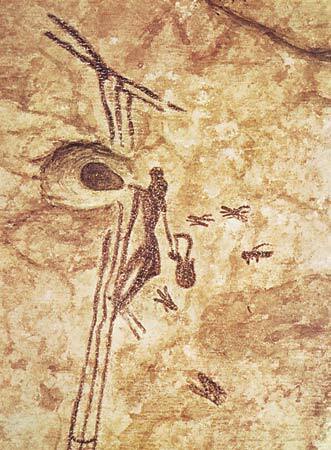 Cave painting, dating from around 15,000 years ago, showing the earliest evidence of the gathering of honey from bees. This was found in caves in Spain. Early civilizations quickly mastered honey hunting skills, as shown in rock art in Africa, India and Spain. Centuries later, Christian monasteries and convents served as apiculture centers. But it took European wars, poverty, land laws and religious persecution to bring honeybees to North America. According to 1493 : uncovering the new world Columbus created by Charles C. Mann, honeybees were brought to North America in the 17th century by European colonists for their honey. Their proficiency at pollination was a world-changing byproduct. 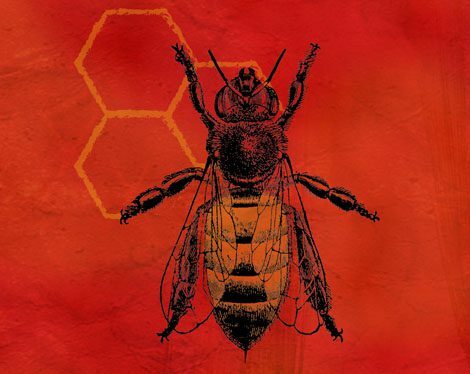 … the biggest ecological impact may have been wreaked by a much smaller domestic animal: the European honeybee. In early 1622 a ship arrived in James loaded with exotic entities: grapevines, silkworms, and bees. The grapes and silkworms never amounted to much, but the bee thrived. Most bees pollinate only a few plant species and tend to be fussy about where they live. But European honeybees, promiscuous little beasts, pollinate almost anything in sight and reside almost anywhere. Quickly they set up shop throughout the Americas. Indians called them English flies. Over the next two centuries, English colonists took bees to New Zealand, Australia and Tasmania, completing human-assisted migration of Apis mellifera around the globe. Beekeeping became commercially viable during the 19th century with four inventions: the movable-frame hive, the smoker, the comb foundation maker, and the honey extractor.